Is Donnybrook becoming a ghost town? 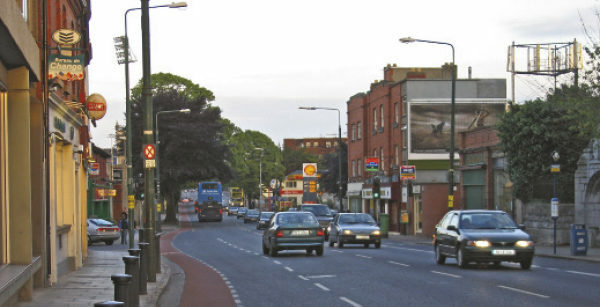 A spate of shop closures over the last few years in Donnybrook has given rise to some concern that the once-thriving village is in danger of turning into a ghost town, or worse, a signpost on the Stillorgan Dual Carriageway on the way to Wexford. Numbered among the recent casualties is Donna the Florist, Dunnes butchers, Molloy’s fish shop, and Kiely’s pub. While the flower shop is still trading, sadly it is due to close its doors for good shortly. Donna has been in Donnybrook for many years now, and always has a welcoming smile for everyone. When NewsFour talked to her recently she said she was very sad to be closing and would really miss the people coming in for a chat. She told me she doesn’t have any immediate plans to open again. We all at NewsFour wish her well in her further career. Roy Fox had been something of an institution in Donnybrook, serving the people for eighty years. As well as the Mecca of fresh vegetables, it was known for its exotic herbs and spices, and superior pastas, imported from Europe and Asia. Joanne Donnelly was the third and last generation of the family to work in the shop. Shortly after her grandparents Sheila and Frank began working there, romance blossomed and they fell in love. The couple eventually bought the shop after Roy’s untimely death, with many happy years ensuing. Sadly, however, due to market pressures and being underpriced by the big supermarkets, the shop closed for good in December 2016. Two purveyors of meat are also noticeable losses. Molloy’s fish shop, next door to Roy Fox’s, closed following the sudden death of owner, second-generation fishmonger Peter. The shop was known for its fresh fish, organic smoked salmon and Dublin Bay prawns. Peter’s wife Miriam carried on for a while, but it too eventually succumbed. A similar fate befell Dunnes the butcher. As well as choice cuts of meat, they dry-aged their beef by a process of hanging it for four weeks in a special room. This allows natural enzymes in the meat to break down the muscle tissue, allowing for better texture and taste. While the big stores may be convenient and able to offer lower prices, the local shops provide the soul of a town. When they begin to drop off, one by one, the town simply dies. The closure of Kiely’s pub last year left a yawning chasm in the social life of the village. It was granted its first licence in 1739. Popular restaurant O’Connell’s also closed before Christmas. People miss chatting to Tom as he watered the plants outside. The lease on the premises is up for sale again and it’s hoped it will reopen soon. Financial institutions have suffered too, with two banks and the post office closing in the past few years. For Bank of Ireland and Ulster Bank, it was probably due to the ever-growing trend in online banking, and the increasing move towards machine-operated banks. There is only one bank now remaining in Donnybrook. Post office closures all around the country are causing a lot of controversy, with people saying it’s destroying local communities, and Donnybrook has been no exception to this. The post office was located at the rear of Donnybrook Fair and acted as a kind of impromptu meeting place for half the village, especially on Fridays. A spokesperson for An Post told NewsFour that they tried very hard to find a new location for the post office in Donnybrook, but with rising rental costs it proved impossible. In the end, they moved their existing customers to branches nearby, either Ranelagh, or the one in Ballsbridge or Baggot Street. He said they have no plans to move back to Donnybrook. A proposed six-storey, 71-bedroom hotel adjacent to the fire station has been given the green light by an Bord Pleanála. Many locals object to this on the grounds that they maintain it is out of character with the area, and that the proposed building is too tall. Certainly, it could be a boost to the hospitality industry, which counts as a positive, but on the other hand it would cater predominantly to passing trade, and its impact on local business and the life of the village would be negligible. Donnybrook is a picturesque village only about a half-hour walk from the city. It is also well-served by an excellent bus route, and not far from the Luas (Ranelagh and Milltown) and DART (Sandymount and Lansdowne) services either. It looks clean and well-kept, for which praise must go to the Donnybrook Tidy Towns Committee for the hard work and effort they put in, winning an award in the Tidy Towns last year. It has a unique character, and is steeped in history, going back to St Broc in the eighth century. The people are warm and friendly, and traditionally there has always been a wide selection of businesses, from travel agents to furniture shops, to friendly local newsagents (remember Furlongs?) I even remember a shop selling headstones at one time! While a new hotel may have its merits, it can hardly replace the small local trader. Here, whether it be the local butcher, grocer or newsagent, you went in almost for the social aspect as much as anything else. You knew the shop owner by name, and more than likely he knew yours. You chatted about the local gossip, maybe to ask after someone who was in Vincent’s, or reminisce on old times. There was a tangible intimacy here that cannot be replaced by the sterile supermarkets, no matter how convenient, or how clever they are at luring us in with ever-decreasing prices. It’s particularly worrying when it comes to products like meat. The big supermarkets aren’t employing butchers, and even when they say their meat is produced in Ireland it doesn’t mean it is Irish beef or pork. In time, these trades will be lost, like the dry-ageing technique mentioned above, and when they’re gone we won’t be able to get them back. It’s not just a question of a few shops closing, but a whole community that goes into decline. A traditional village, like Donnybrook, is not just a collection of shops and business that happen to be grouped together in the same location. It is a community, an organic unit, and when you damage one part you affect all of it. Let’s hope this trend of closures can be reversed and before long we see Donnybrook as the vibrant village and thriving little community and it once was.